The image of the benefits-scrounging migrant is potent, but there is no evidence that this is widespread. Migrants come to work and make lives, not to get a free ride. Amy Ludlow on Migration in the Brexit Debate from UCL European Institute on Vimeo. Photo by author. Fair use.The rhetoric is familiar: “Tax credits ‘turned UK into a honeypot for EU immigrants’: worker on minimum wage could receive additional £330 a week”, as one Daily Mail headline read. 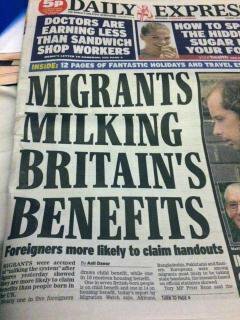 The drip, drip of negative press about EU migrants and benefits has pushed the issue to the top of the political agenda. In his November 2015 speech, which set out what he would like from ‘Brussels’ in the renegotiation, the British prime minister David Cameron made it clear that he wanted to “tackle abuses of the right to free movement, and enable us to control migration from the European Union, in line with our manifesto”. Benefits in particular were in the prime minister’s sights: the government argued that 40% of EU migrants claim in-work (e.g. housing benefit and tax credits) or out of work benefits (a claim that has been subsequently criticised). He therefore argued in his letter to Donald Tusk, the president of the European Council, that “we can reduce the flow of people from within the EU by reducing the draw that our welfare system can exert across Europe. So we have proposed that people coming to Britain from within Europe must live here and contribute for four years before they qualify for in-work benefits or social housing. And that we should end the practice of sending child benefit overseas”. In fact, the number of EU migrants claiming benefits in the UK has long been contested. Equally contested has been the more general claim that migrants, particularly coming from eastern European countries, are a burden on the UK economy. In fact, evidence points in the opposite direction. According to UCL researchers Christian Dustmann and Tommaso Frattini, migrants have “paid more in taxes than they received in benefits, helping to relieve the fiscal burden on UK-born workers and contributing to the financing of public services”. FullFact, an independent fact-checking charity, considers EU-8 migrants as net contributors to the UK’s economy. They estimate that recent immigrants from EU-8 countries (countries that acceded to the EU in 2004, including Poland, Hungary and Lithuania) contribute £1.12 for every £1 they receive in state assistance. Those from the rest of the EU put in £1.64 for every £1 of assistance. The government itself does not know how much EU migrants cost or benefit the UK. 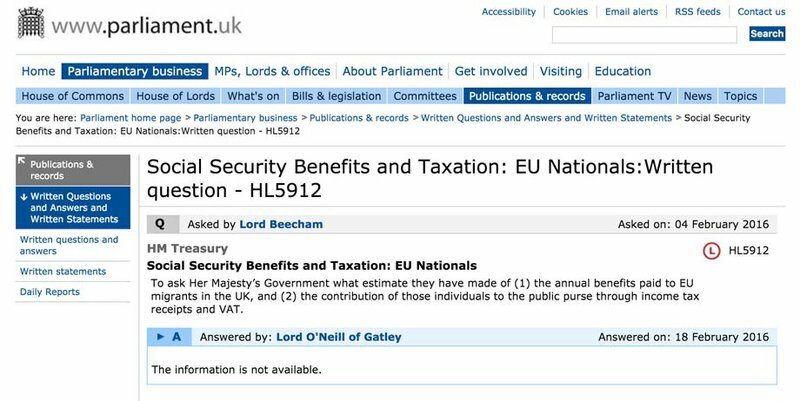 In response to a question from Jeremy Beecham, a member of the House of Lords, on 18 February 2016, Jim O’Neill, the commercial secretary to the treasury, replied that “the information is not available”. Nevertheless, Cameron was determined to address the benefits issue in his resettlement negotiations in Brussels on 18 and 19 February 2016. As he had said to Donald Tusk, he wanted a ban on migrants receiving in-work benefits for four years and a ban on the exportability of child benefit. He didn’t quite get what he wanted but he came reasonably close. On in-work benefits he got a so-called ‘emergency brake’. This is not quite what it seems. In essence, if the situation is bad enough (i.e. there has been an inflow of workers from other member states of exceptional magnitude over an extended period of time) in the host state, then the state can ask the Council of the European Union to give it the discretion to stop providing in-work benefits for EU migrants for up to four years. The European Commission has already accepted that the situation in the UK satisfies the exceptional magnitude test. However, the emergency brake does not deliver a total ban on in-work benefits. Rather, the limitation should be graduated, starting at complete exclusion but gradually increasing access to benefits over the four-year period to take account of the growing connection between the migrant worker and the labour market of the host member state. This will apply to newly arriving EU workers for a period of seven years. As far as child benefit is concerned, again Cameron did not get a complete ban on exportability. Instead he got an option to index such benefits to the conditions of the member state where the child resides. At first this applies only to new claims made by EU workers in the host member state, but from 1 January 2020 this will also apply to existing claims . Both the emergency brake and the restriction on exportability of child benefit require the amendment of secondary EU legislation. This will be set in motion only once (and if) the UK has voted to remain a member of the EU on 23 June. The legislation will follow the standard ordinary legislative procedure, which means the agreement of the European Parliament and the Council of the European Union is required. Any resulting amendment to the secondary legislation can be challenged before the European Court of Justice as potentially contravening article 45 of the Treaty on the Functioning of the European Union (TFEU), the primary law provision guaranteeing free movement of workers at EU level. So will the new settlement deal make any difference? Both the prime minister and his counterparts knew that these negotiations were not really about reducing immigration to the UK or even about saving money; no serious analyst, inside or outside the UK government, thinks the impacts will be significant. Instead, they were about sending a signal. In the case of the prime minister, that it was possible to treat EU migrants differently from UK citizens for the purposes of in-work benefits. For eastern European leaders, it was about showing that their citizens could not be treated as second-class Europeans. Portes is not alone in thinking that Cameron’s reforms will not make any difference. Research conducted by the University of Glasgow reached similar conclusions: “most [EU-8 migrants] had very little contact with the benefits system, despite being in low-paid jobs, and often chose to go home for medical treatment rather than rely on the NHS”. Our own research with EU nationals in the UK, conducted as part of the UK in a Changing Europe project, confirms much of this. Interviewees have almost unanimously described the main factors driving EU nationals to the UK as work and opportunities for personal development, including the learning of English. Receipt of benefits (the details of which are often hazy to migrants) does not feature. Job advertisements in an eastern European food shop in Spalding, Lincolnshire. Photo by author, all rights reserved. Take, for example, Velma (not her real name) who has been in the UK for four months. In Lithuania she had an office job. In the UK, she found work in an eastern European food shop in Peterborough the day after she arrived. She now earns four times what she was earning back home by working 26 hours a week in the shop. She has not claimed any benefits and has no plans to do so. “I want more work”, Velma says, “I’m not interested in benefits”. Likewise, Jose, who came to the UK just over three years ago with his girlfriend, who is training to be a nurse, told us that “the reason to come here [to the UK] wasn't benefits. In Spain I could have more benefits if I wanted”. 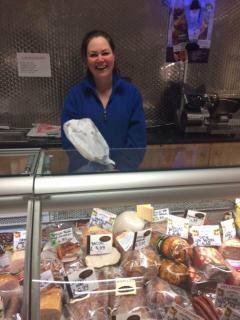 Velma, at work behind the counter of an eastern European food shop. Photo by author, all rights reserved.As Malgorzata, a Polish dentist working in the East of England, put it, “most people from other EU countries working in the UK aren't worried about the benefit cuts because everyone is in work, or can get work because they're prepared to take any job to pay the bills, including the sort of work English people don't want to do anymore in the fields, cleaning, in factories”. In her view, if Britain decides to ‘shut the borders’ or make EU nationals feel so unwelcome in the UK, the real losers will be British people and British businesses. “There are so many EU workers in the UK right now that employers have high flexibility,” she said. “If the government shuts the borders then employers will have less flexibility and workers will have a stronger bargaining hand. It would be a shame if the UK left the EU because being in the EU makes it easier to live here but people are flexible, they will just move to where they are welcome – there are lots of fields and factories in France, Norway, Germany […]”. These interviews suggest that economic motivations for migration are the driving force to spur migration. However, we have spoken to a number of EU nationals whose migration has been much less economically calculating. Take the case of Maryla. She came to the UK a couple of years ago with her husband and children from a small town near Warsaw. “I came to the UK to learn English, get some experience and try something new”, she told us. While Maryla has enjoyed many aspects of life in the UK she has found parts of it difficult. “It's been hard to get the job I want”, she said. “I don't want to flick through invoices all my life. I've made over 600 job applications, for basic posts as well as lecturer jobs, but the impression I have is that employers don't trust my qualifications in the same way that they trust British qualifications”. So Maryla has decided to return to Poland. She says it has been a difficult but necessary decision; even with her and her husband in full time employment, they are not earning enough money to buy a property and settle down in the UK. “We'll earn more in Poland and so we will have a better quality of life”, she said. “I want good things for my family. I'm not interested in staying in the UK just because it's possible. We might even go and live in another country”. We have also been asking our interviewees what effects Cameron’s new settlement deal might have upon their own lives and the decisions of others who might be considering coming to the UK. Reactions have varied. Some EU nationals, like Jakub from Poland, have told us that they or their close friends and family have applied for British citizenship because of concerns about their future in the UK after a potential Brexit. 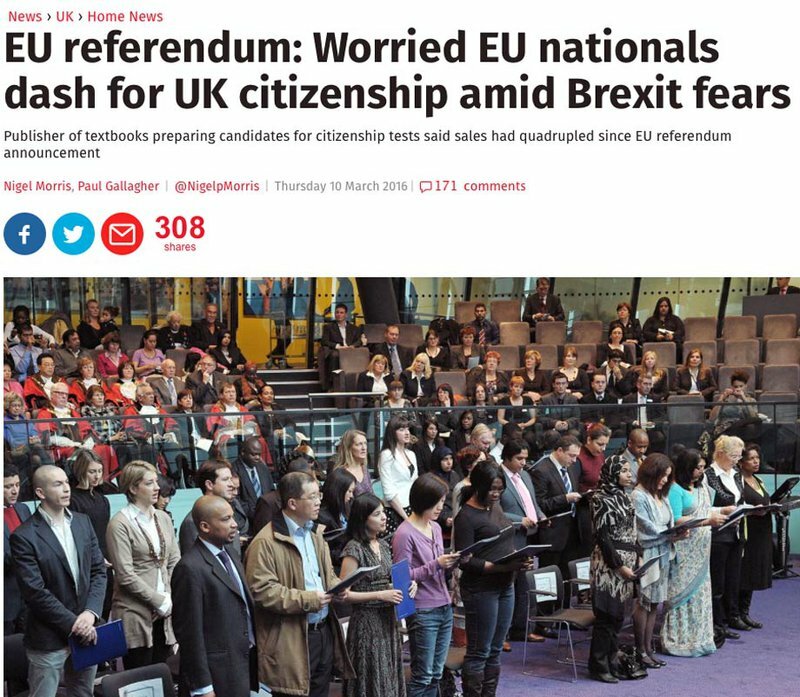 This is consistent with a report published recently in the Independent that sales of textbooks preparing candidates for citizenship tests have quadrupled since it became clear that Cameron would hold his promised EU membership referendum in June. The Independent, 10 March 2016. Fair use. Some EU nationals have experienced the anti-migrant narrative that has accompanied the changes to benefits entitlements as inaccurate and alienating, even though the changes are of no personal consequence to them. As Jakub explained, “Media usually focuses on migrants who work in agriculture, or in […] low skilled jobs, and always the counterarguments showing the problems with immigration come from unemployed English people that give their views, saying that their jobs are being taken”. He continued by saying that “people like myself don’t get a voice. The whole debate doesn’t show us. It kind of bypasses the input or contribution of people who have a certain level of language skills and qualifications who are contributing to the economy like any other UK employee. This type of people are blended into the mainstream society”. Roza is a Polish national and has lived in the UK with her two children since 2007, after her husband was head-hunted to come and work for a British firm. She told us how life has become worse for migrants since she first came to the UK. “Now, even walking on the streets, if we meet a drunk man [...] I have heard how bad my nationality is and that we should go back to Poland. And I understand, it’s a drunk man. But it's happened now. It has changed something”.